Some of you may be familiar with Studio Gear Cosmetics, as they are most popular for their core line of quality makeup brushes that are lifetime guaranteed! They also carry skin care products, as well as an assortment of makeup. They are new members of the Ulta family, and continue to grow a large following. All of the shadows go on smooth, are well pigmented, and easy to blend. In my book, that makes them pretty high quality. However, I do wish there was at least one matte color in the palette. I usually prefer not to do an eye with entirely all shimmery shades, but because it is a Holiday palette it's definitely understandable. We can be gilded for the holidays. On the plus side, they're not tacky shimmery, it's simple, classy shimmer. The first look I created was the "softer" look. On the top portion of the palette is a little guide showing where to place each color on the eye to create either a soft or dramatic look. You can see how the shimmer is subtle and by following the guide, your end result is a very pretty, soft holiday look. The next look, following the guide, is the "dramatic" look. Basically, the Coal (black) color is used on the lid from lash to crease, instead of just the crease in the soft look. It's just a smokier look. The actual size of the palette is just a little bit smaller than the length of my hand, and just a tad wider. Super convenient for travel as it'll fit easily in a handbag. Confession: It's been accidentally dropped, ( don't judge- I have a nosey 3 yr old) and no broken pans! This thing is sturdy! Overall, my favorite was the cheek color, Snowy Glow. It's the perfect peachy pink, and it has a subtle sheen that's really pretty! 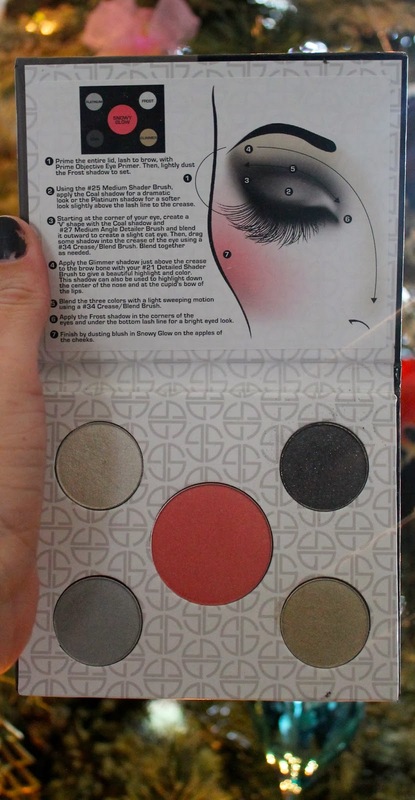 I am really impressed with the color payoff and quality of the whole palette! I've really enjoyed Studio Gear's Holiday palette and I look forward to using it more while getting winter fancy this season! For more info or to pick one up for yourself or to gift, visit StudioGearCosmetics.com and for 10% off your purchase enter code: SGHOLIDAY at checkout. You look gorgeous in the last picture. The palette looks really nice! Not something I would usually go for though. Wow. I love how dramatic it looks on you. Very pretty. I love both of the looks you posted! I think I'd want to go with the first look for my everyday wear. I love your liner in the second look though- wish I could get mine to look that flawless!